Curator’s note: This is the third of five blog posts made by students in Dr. Perks’s spring 2015 Media Marathoning class at Nazareth College. Students conducted qualitative research projects in groups addressing one research question. These blog posts represent their distillation of findings that are also reported in 8-10 page essays. This post is from Joel, Joey, Kyle, and Nick (AKA the “bro row”). 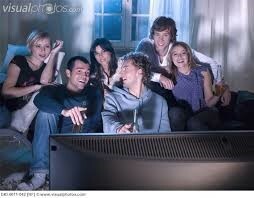 Media marathoning invites so much social culture between peers, family members, and strangers across the globe! In order to find out a little bit more, we conducted four interviews, one for each of our group members. Our interviewees were from relatively similar demographics, all between the ages of 20 and 24. 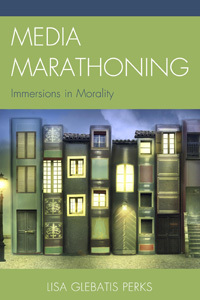 The underlying question was whether media marathoning invited more social culture than before the marathon. By social culture, we mean entertainment created by communication between individuals. What are the forms of social bonding experiences created by marathoning? Do serial and episodic texts invite different social bonding experiences? Do relatable shows encourage more social interaction? The results of our interviews and analysis show that there are numerous ways to enact in social experiences with peers! Whether it is an in-person ‘Girls Night,’ over the phone conversation with a buddy, or communicating with headsets on multiplayer gaming, all of these ways support social interactions when marathoning! We found that episodic forms of media (those without ongoing plot lines, such as Friends) invite more fun social gatherings, complete with drinks and ongoing conversation. Serial forms of shows (those with ongoing plot lines, such as Bates Motel) require a lot of attention to detail, and they require peers that are interacting to focus and not disrupt the material. As for being relatable, we found that, yes, the more relatable media is to the viewer’s personal values, situations and experiences, the more likely one is to view that material. Whether one is projecting themselves onto the character on screen, or relating their relationship issues, school issues, or societal issues to the media, viewers are continuously choosing material that themselves and their social culture connect with. The interviews showed that some viewers aren’t willing to go the extra mile to communicate with others through the Internet about their favorite media. Online communication about media is thought to be too ‘intense’ for many people. Marathoning can draw your friends together in many, many ways. The possibilities are certainly endless!